Premier Auto Trade has introduced a new range of Ignition Coil and Lead Set Kits as part of their Engine Management and Service Components range. 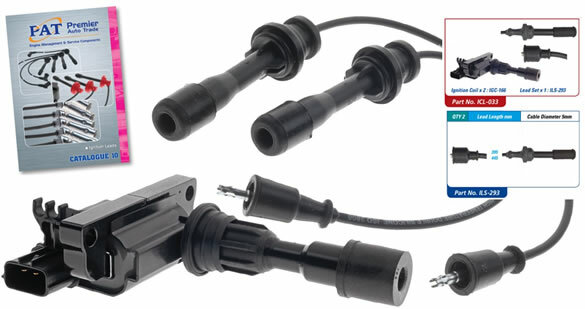 The new ICL Kits include the required number of high quality OE ignition coils for the specified vehicle, along with the corresponding OE replacement ignition lead set to match. This makes ordering the correct number of ignition coils and leads a simple, cost effective process. The Ignition Coil and Lead Set Kits include quality products from some of the world’s leading manufacturers including Bosch, Delphi, Bougicord, VDO and Intermotor. Around 50 ICL Kits are being offered to suit thousands of vehicle applications. The ICL Kits are detailed in Premier Auto Trade’s new Ignition Leads Catalogue and are available from specialised resellers and leading automotive retail groups. This new catalogue features vehicle application listings and details for thousands of vehicles, allowing fast and accurate identification of the Lead Set or Ignition Coil and Lead Set Kit required. The new catalogue also includes clear colour photographs of ignition coils and lead boot ends along with detailed individual lead lengths and cable diameter specifications.